NOW 35% OFF NEW IN THE BOX PLATE TAMPERS & J TAMPERS WHOLESALE DIRECT MS 10 LATEST EPA3 ENGINE 6.5 HP, Plate Size 20 X 14.5 - 150 LB, Belt Drive, Includes Transport Wheels & fold down handles. Tampers will compact to a depth of 1 foot (30cm). Tamper include engine & tamper manuals, spare belt, air cleaner, gas line and spark plug wrench. These are excellent tamper, why rent when you can own one for only...... NEW MS 10 150 lb $1650.00 35% OFF -$ 577.00 you pay $1,073.00 NEW MS 20 200 lb $1890.00 35% OFF -$ 661.00 you pay $1,229.00 NEW MS 80T 200 lb $1940.00 35% OFF -$ 679.00 you pay $1,261.00 c/w Water Tank. NEW MS 160 350 lb $3360.00 -35% OFF -$1,176.00 You pay $2,184.00 c/w Transport Wheels and has Forward & Reverse. NEW MS 330E 550 lb $4,995.00 -35% OFF -$1,748.00 you pay $3,247.00 c/w Latest EPA3 4 Stroke Engine 13 HP Electric Start c/w Forward & Reverse, Compaction Depth 28 inches, Centrifugal Force 38 KN, Plate Size 33 X 26 folding handle bar. Works great for Tamping the pad for hopper bottoms. New LTR 72 JUMPING JACK $2,195.-35% OFF -768.00 you pay $1,427.00. 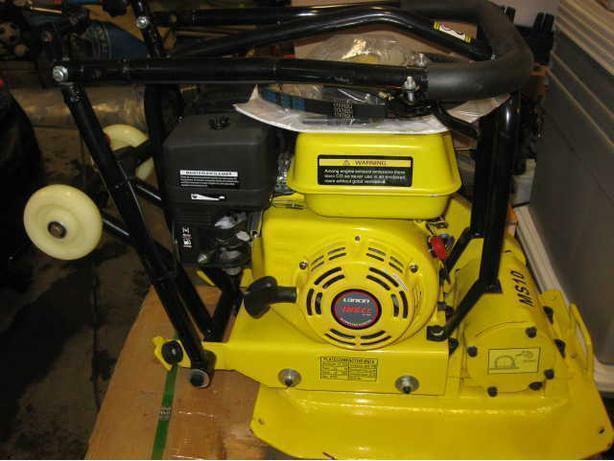 Latest EPA 3 Engine 6.5 HP, Steel Round Rack To Protect Engine, 159 lb, (also have in 195 lb) Lift Hook, Convenient Rollers For Easy Loading, Heavy duty Shock Rubber-Absorbs Kickbacks and ingenious Throttle Lever For Smooth Operation Thanks Contact Dale @ 780-983-5582 Tampers are located in Leduc Delivery available if needed.